Under Windows 7 64-bit ultimate edition, I’ve had the need to reset my “Windows XP Mode” to initial settings several times over the past few days. Initially I did this because as I used the XP virtual environment, the VHD file grew to around 10 Gig. Not huge, but I wasn’t using it for anything except to run a client’s 32-bit only VPN software, so it was wasting a fair amount of space. My main machine has a 256 Gig SSD for the main drive, so I am conservative with space consumption. The second reason was that I was helping my fiancée (a high-school teacher) obtain some (public domain) video for use in her classroom. Unfortunately this video seemed only to be available in a heavily watermarked version on YouTube (ugh) or in a Real Media stream (double-ugh). So I wound up needing to use a mixture of open source and very old software to convert this video to a format that was playable in the classroom. As a rule I don’t install software like that on my production machine – a virtual environment is a great “sandbox” for momentary needs like this one. After I converted this video, I no longer needed all these (rather buggy) utilities, so I wanted to start clean. I didn’t see much on the web on how to reset the “Windows XP Mode” to initial settings. I tried this experiment, which worked pretty well. This entry was posted in Operating Systems, Virtualization. Bookmark the permalink. Worked like a charm, thanks for the helpful instructions. Glad it helped! Thanks for letting me know it worked for you. Thanks for the tip, it worked well. Just note that the folder is called C:\Users\Tom\AppData\Local\Microsoft\Windows Virtual PC\Virtual Machines\Windows XP Mode without the “.vhd” in the end. Good point. Thanks for the clarification. Glad the blog post helped. Interesting concept. Wish it worked for me. When I tried this, I just got a message that files were missing and then it removed the VM’s entry (the .vmcx in \Users\[user]\Virtual Machines ). Sorry to hear the steps I outlined did not work for your particular environment. As I mentioned in my original post, the techniques I described seemed to work for me in two different environments, but there is always a risk that your mileage my vary. Thank you times 3! This really helped, since it avoids the user having to Delete his whole user account (or open a new account). I think i will include these instructions along with my hard copy of WXPMODE. Danke! Thanks for your post Tom. Worked great. Just a clarification on something I noticed. You really have to click on the “original Start Menu shortcut” like Tom said. This means clicking on All Programs->Windows Virtual PC->Windows XP Mode. I noticed that if I clicked on Windows Virtual PC->Windows XP Mode, because I recently was using the Virtual PC and Windows gave me a most recently used program shortcut, that nothing happens. You won’t get the Cannot Start Windows XP Mode error and button to Create New. Thanks for the clarification about the Windows shortcuts, Brian. Old post but just so you know … saved me today! 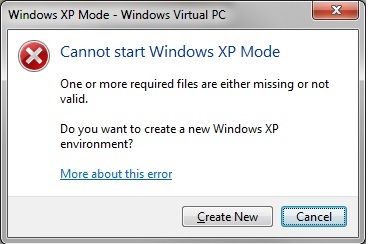 Not sure why my XP Mode decided to stop working after reliable use for a couple of years … but I could NOT get it to work. Deleted those 4 files, and voila!